In a skillet, heat canola oil. Add onions and stir until tender, for approximately 1 minute. Add shrimp and cook until shrimp turns pink and is thoroughly cooked. Add one chipotle chile and 2 tablespoons adobo sauce. Cook for 5 minutes, stirring rapidly, for approximately 3 minutes. Remove and discard chipotle chile from mixture. In a separate skillet warm tortillas. Add shrimp mixture and top tortillas with cheese. Fold tortilla in half and heat for 1 minute each side or until cheese melts. For a kid friendly version, replace chipotle chiles and adobo sauce with tomatoes and lime juice. Getting dinner on the table can be a messy and a long process. For a working mom, having plenty of time to prepare meals is a luxury most of us just can’t afford. But you don’t have to sacrifice eating deliciously good food because you don’t have time to prepare a meal. 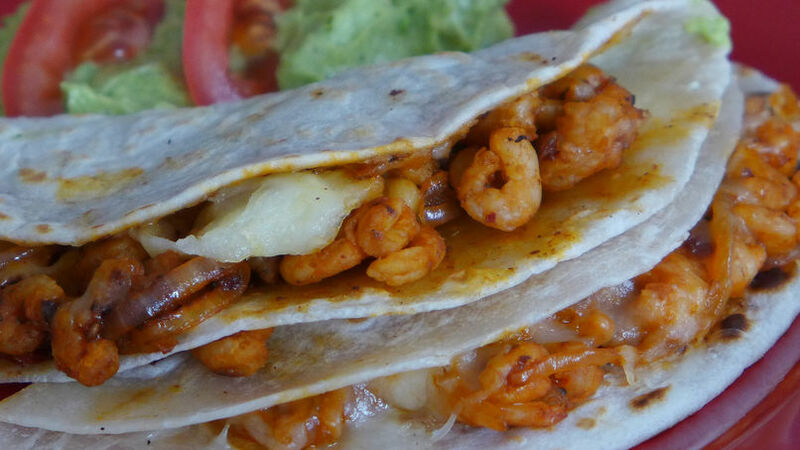 If you’re looking for a quick, 5-ingredient meal, shrimp quesadillas are perfect! They are so tasty and super easy to make, that they’ll become your family’s next favorite meal!